Starring a quartet of sitcom veterans, The Cool Kids TV show has no shortage of comedy talent on the screen. But, can this group of seniors attract high enough ratings to stay on the air? Will The Cool Kids series be cancelled or renewed for a second season on FOX? Stay tuned. 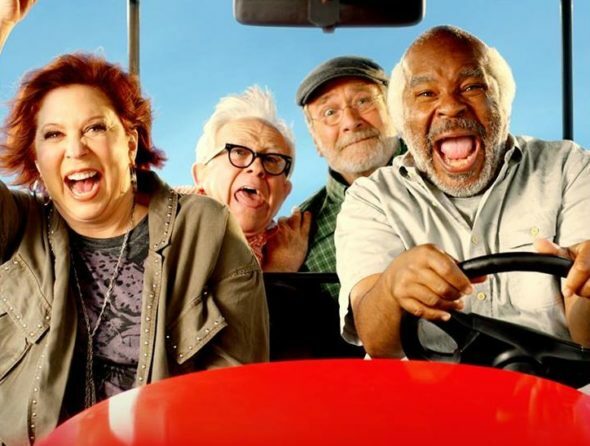 A multi-camera sitcom on FOX, The Cool Kids stars David Alan Grier, Martin Mull, Vicki Lawrence, and Leslie Jordan. The TV show revolves around a loyal but motley crew who live at a retirement community and will break any rule to have fun. Though they may be older, this quartet is far from done with life. The self-proclaimed “cool kids” are determined to make the third act of their lives the craziest and most interesting one yet. What do you think? Do you like The Cool Kids TV show? Should it be cancelled or renewed for a second season on FOX? The cool Kids should be renewed. This show is really funny, and deserves to be on for years! We love it, and watch all the re-runs as well. Keep the FUN coming. Don’t cancel this show. There are so few good comedy’s on!!!! This cast is ‘da bomb’. All of them are great comics and play well together and the plots are very original. Great writers! Keep it going and more Cool Kids, please! We always tune in or tape it! Love this show! LOL! Do NOT cancel and maybe change the time slot to Saturday/Sunday where more people can tune in? Finally……a funny show! Congrats to the writers and actors! Love love love this show! Funniest show on tv ! Love the Cool kids. We have friends over and we all watch it together. I love the cool kids! Why do 18 to 49 year olds matter so much? We watch more tv than they do! Love this show! Finally a show with actors who are talented, funny and truly gifted at their craft. Network TV had so little to offer with comedy shows that are well done and relatable to this generation. Please don’t cancel the kids! Please keep it on we love it, finally a really funny sitcom! I love this show!!! Please keep it coming!!! !